Programs React, X1t, and X2t in the Standard and Professional editions of The Geochemist's Workbench® can trace the progress of various types of kinetic reactions: dissolution, precipitation, redox transformation, and microbial catalysis and growth. Release 9.0 of the GWB accounts for three new types of kinetic reactions, as shown below. GWB9 can evaluate rate expressions for the association of dissolved species to form aqueous complexes, as well as the dissociation of complex species. Click the image at left to see a React run tracing the complexation of F– with Al3+. The link below opens a step-by-step tutorial. 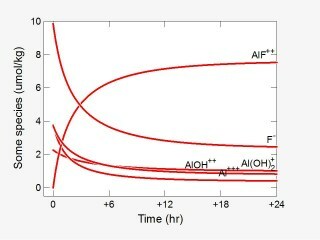 React, X1t, and X2t can include in a simulation the sorption or exchange of aqueous species onto mineral surfaces, and the release of species into solution as they desorb from a surface. 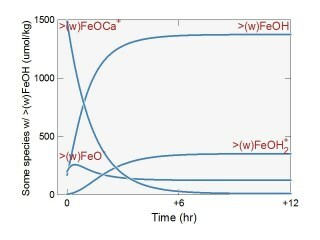 Click the diagram at left to see a React simulation of the desorption of Ca2+ from ferric oxyhydroxide, or below for a step-by-step tutorial. GWB9 can evaluate rate expressions describing the dissolution of gases from an external reservoir, and the exsolution of gases into one. The image at left shows the results of simulating with React the kinetic exsolution of CO2 from a fluid. The icon below opens a tutorial.